I first picked up Six of Crows in June 2015 and I’m very sad to report that I didn’t finish it. I read about 130 pages before quitting. I knew it wasn’t for an objective reason; I just wasn’t feeling it at the time and was bored. I finally decided to give Six of Crows another chance and it was a great decision—this time I LOVED it! As I read, the book just kept getting better and better. It started out okay, then got really interesting, then got really good, then ended up AMAAAAZING! I actually enjoyed Six of Crows much more than the original Shadow and Bone trilogy. I liked that trilogy, but the first book was my favourite and the second two didn’t quite live up to it. But Six of Crows is now my favourite! The worst thing about reading Six of Crows was finishing it and not having Crooked Kingdom on hand. I didn’t want to buy it until I was confident I was liking Six of Crows this second time around. I have ordered it now but The Book Depository takes a million years to deliver! GRR! I am looking forward to Crooked Kingdom destroying me though. Everyone says it will. How exciting that you loved the book on your second chance!!! This book is one that is quite beloved in the bookish community and I am a bit afraid to pick it up, but I might have to at some point. I want to say “I told you so” but I don’t think I ever did that… But still. I TOLD YOU SO. This is one of my favorite series out there and I need moooooore of all these babies. I was a bit worried going in because I’d also finally finished the original Shadow and Bone trilogy and while I liked it, I didn’t really LOVE it. 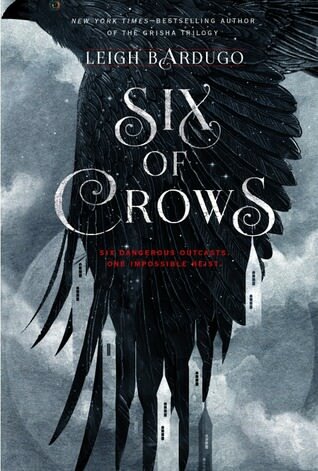 But OMG I love Six of Crows so much more! Just goes to show that timing can contribute a lot to how we feel about reads! Glad you loved it the 2nd time around!